The Creative Bubble: Mom's Monday Mingle! 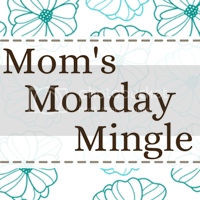 Welcome to Mom's Monday Mingle! Would YOU like to "Co-host" with us? Thanks for the note Renee! Linking up for first time, excited to read everyones blogs. New follower from the Monday Mingle! Thanks for co-hosting! Your newest follower! You take great food pictures; I haven't figured out how to do that yet ;-) Looking forward to trying some of these recipes! Thanks Elizabeth! I like the name of your blog :) Following along with you as well! Your Brie Cranberry muffins look amazing, I'm pinning. Hope you week is filled with Blessings! Thanks for the pin and following me! It's nice to co-host with you, too :) Following you back! Thank you for co-hosting. Newest follower. Would love a follow back. You have a cute, cute blog! Thanks for following along, and I'm following as well. I'm a new follower & FB fan. Thanks for hosting! I'm a new follower from Mom's Mingle! :) I absolutely love your cute blog design! How fun! Can't wait to get to know you! Hope you'll stop by and say hi sometime! Hi there! I'm a new following and just linked up to the party. Hey there. Thanks for the follow :) Looking forward to checking yours out, too! Hi! following from Monday Mingle. This is such a beautiful blog. Good luck!!! Hello following you from the Monday Mingle. Thank you so much for co-hosting. I really like your blog the layout is great.